The band is made of tobacco. It kinda winds up looking like a homemade paper project. Nice touch of germane to the plot marketing. Also, this whole schpiel of outer leaf wrapper packaging reminds me of Trader Joe's. Gentlepersons, head on down to Cigar Reserve, whom I thank for this offering. Very healthy looking stick. The lore is that Island Jim wrapped a stick in a tobacco leaf because no cello was on-hand. He afterward realized how great it looked upon unwrapping. Regardless, and to reiterate, very healthy looking stick. Chocolate brown spectrum artist pallet color wheel thingy. In other words, not even complected, but pretty. Reddish under-hue. Some fine tooth pokes through espresso bean marblings. Minimal veins; some spiders go horizontal -- none egregiously so. Tight nigh invisible and even veins. Triple cap is sturdy, but a bit short on one end. Foot tobacco is a auburn with uptick or two to dirty blonde. Greenish under-hue at the foot. Packaging eyeballs to a -full density and evenly thusly. Hand-feel is a heckuva heft. Good weight, nice balance (notable in a fully stuft Toro), and -firm on the Charmin Squeeze test. Zilch by way of soft spots. Excellent. Tooth appears finely on the hand, as do oils. The overall feel is working class refinement. Desert island chic, more. Again, very in-step with the marketing devices. Schnozzing the shaft, I get a nice earthy tobacco with wood and barnyard influences at the shaft. At the foot, some leather and white pepper is added in. I Old Timer pocket-knife off the cap. Cold draw is a medium consistency and delivers sweetly spiced notes of earth and wood. Leather is underneath and into the cold finish. Some warm vegetal is there, as well. Toasting the foot goes easily, especially considering the firmness of the pack. Aroma is of toasted woods and worked leather. Some spice rack, sweetly warm. First hot pull is particularly floral. Spice rack highlights a cayenne. Wood firms into an oak with red seasonings. Leather carries. Second hottie is retro-haled and a zetz of cayenne now is felt alongside a white pepper. On the tongue is a floral caramel sweetness which is quite nice. Oak continues to flex and is now primarily a nutmeg seasoned thing. I like a delineated spice rack, I does. Third hot one has a vanilla bean vibe add-on. Burn is a tad ribbon off the usual outdoors wooden match light. Burn-line is at a -medium thickness. Ash is an even-complected light grey and is tightly ladder-runging on. Draw is a lovely medium with just the slightest nod toward +. Packaging softened only a half-tick off the light. Smoke out-put is medium+ and room-note is sweetly vegetal laced. Mouth-feel is a slim cream and slight cayenne tingle, great moisture level. 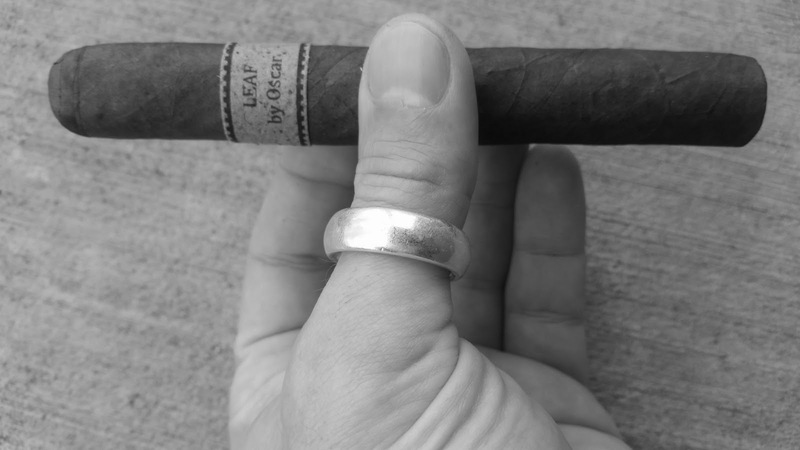 Finish is complex tobacco with vanilla, barnyard, and vegetal aspects. Cayenne stays mainly contained in the retro-hale where it's paired interestingtly with a roasting vegetal note. White pepper occupies draw. Someone is baking a nutty sweet bread in a wood oven. Smoke off both ends out-puts up to -full. Packing re-firms to it's pre-light density. Very well-built, this Leaf. Very smooth and even draw. Very well-orchestrated delivery of smoke and notes. Profile is a robustly displayed medium, strength is a -medium. Ash pales further. Nuts in the sweet bread are almond slivers. Vanilla goes from previous bean vibe to an extract that plays well in the oak oven. Floral tones pick up a light honey. Caramel and cayenne pair up now and mellow a tick. Very well partnered and balanced. A creamy note inserts itself throughout. Almond slices step up; find the finish in a near candied manner. Ash lilts at an inch and I roll it off in my $0.99 Walmart tray -- oily and dense. The ash, not me. Well, not me in this specific case -- but that might be generally apt. Lots of flavors and tandem (at times partner-swapping) notes. Simply(? ): top note is nutmeg and cayenne seasoned woodsy. Middling is floral, vanilla, nutty sweet bread. Undertone is a leather tobacco earth. Very nice. Very. Packing holds, zero loosening of seams. Burn is a bit wavy but not at all is a re-touch thought of. Line is a medium. Ash pales and gets a fleck or two of contrasting charcoal. No flake. Draw is a beaut. Smoke out-put holds. Room-note magnifies its same notes as prior. Gentle and sturdy slow pacing. It's, like, reaffirming, man. Vanilla extract moves to a more caramelized sugar note. Cayenne roasts and softens more. Nutmeg is dancing with floral bits. Vegetal is warmer. Almond separates from bread and is toasted. Oak does, as well. Bread is doughy and sweet, like a Hawaiian or monkey bread. Cream and coffee come in and go near primary. There's a mineral aspect to the lower middling. Finish lengthens on the cream portion of coffee/cream. Mouth-feel is nigh drooly, but braced by the red spices. Ash sheathing; burn is still a tick wavy, but fine. Construction is a brick...house. Combustion is delightfully unchanged. Smoke-out-put is same volume, perhaps a densening whiteness. Room-note gets a coffee addition. Profile is medium+ and strength is a kindly medium. As the final act approaches, ash darkens a tick, flakes a one speck. Pack softens a tick or two, but evenly and retains a lively spring-back. Burn-line thins to a thin+ and evens to almost dead-on. Smoke stays cool in smoke-hole. Chocolate comes in sweetly. Coffee and cream ups. Nutmeg flexes on oak and pulls up higher. Leather muscles. Often flavors lack bracing in the 3/3. Here, with this Leaf, they delineate even further -- and I ain't purged a once. Beautiful. Packing ceases softening, and firms a tick. Notes toast warmly. Smoke stays cool, draw effortless. 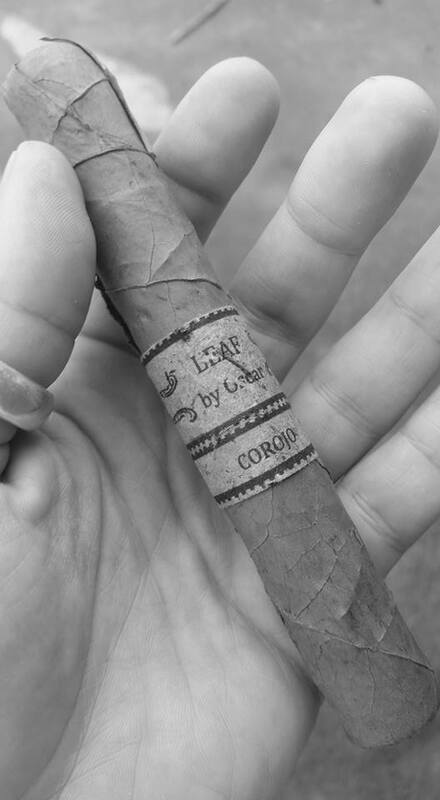 Very tasty stick with accessible subtleties and complexities. Well played, Leaf by Oscar. Well played, verily. Beautiful combustion/construction. Very tasty. Not on-yer-heels complex, but remains interesting throughout. Very accessible and enjoyable profile. I don't see how you can go wrong. Won't stand up to hooch. Tea would be nice. As we travel backward in time.